In this circuit, we are going to use yet another kind of variable resistor – this time, a soft potentiometer (or soft pot). This is a thin and flexible strip that can detect where pressure is being applied. By pressing down on various parts of the strip, you can vary the resistance from 100 to 10k ohms. You can use this ability to track movement on the soft pot, or simply as a button. In this circuit, we’ll get the soft pot up and running to control an RGB LED. Open Up the Arduino IDE software on your computer. Coding in the Arduino language will control your circuit. Open the code for Circuit 10 by accessing the “SIK Guide Code” you downloaded and placed into your “Examples” folder earlier. the color of an RGB LED. we did with the knob-type potentiometer back in circuit #2. Connect one side to 5V. Connect the other side to GND. Also connect a 10K resistor from the middle pin to GND. at zero volts when the pot is not being pressed. they mix to form new colors. the pins are ordered RED, COMMON, GREEN, BLUE. Connect RED to a 330 Ohm resistor. 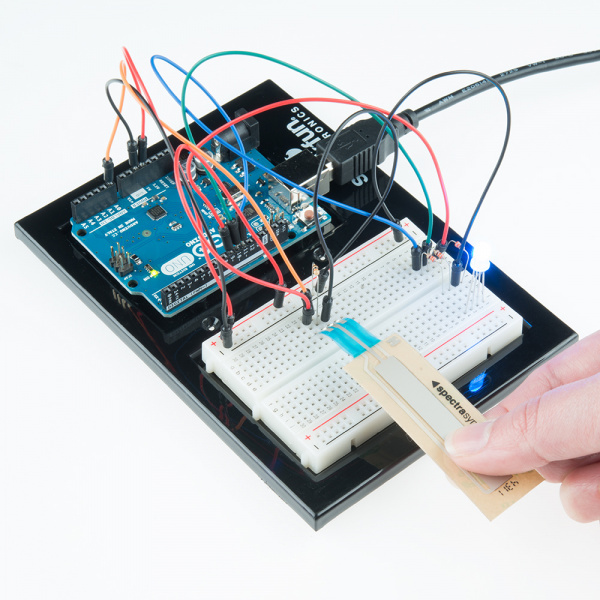 Connect the other end of the resistor to Arduino digital pin 9. Connect GREEN through a 330 Ohm resistor. 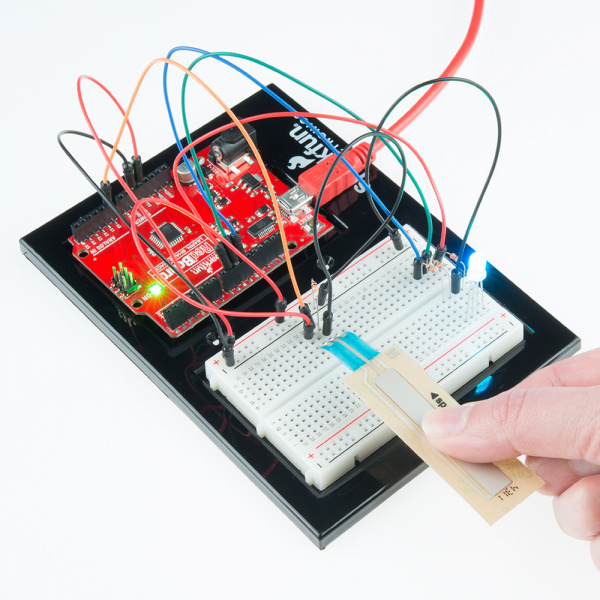 Connect the other end of the resistor to Arduino digital pin 10. Connect BLUE through a 330 Ohm resistor. 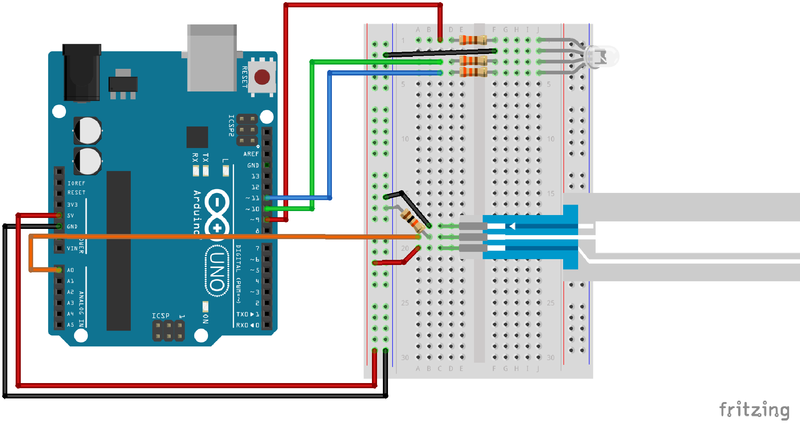 Connect the other end of the resistor to Arduino digital pin 11. // next to them on the board). // Global PWM brightness values for the RGB LED. // These are global so both loop() and setRGB() can see them. // on the RGB "rainbow", and sets the RGB LED to that color. // Set a RGB LED to a position on the "rainbow" of all colors. // from an analog input). // Here we take RGBposition and turn it into three RGB values. // produce a rainbow of colors across the 0-1023 input range. // For each channel (red green blue), we're creating a "peak"
// these peaks with each other, the colors are mixed together. // Create the red peak, which is centered at 0. // Feel free to use this function in your own code! These big, scary functions take a single Value (RGBposition) and calculate the three RGB values necessary to create a rainbow of color. The functions create three "peaks" for the red, green, and blue values, which overlap to mix and create new colors. See the code for more information! Even if you're not 100% clear how it works, you can copy and paste this (or any) function into your own code and use it yourself. You should see the RGB LED change colors in accordance with how you interact with the soft potentiometer. If it isn't working, make sure you have assembled the circuit correctly and verified and uploaded the code to your board, or see the troubleshooting section. The knobs found on many objects, like a radio for instance, are using similar concepts to the one you just completed for this circuit. With the four pins of the LED so close together, it’s sometimes easy to misplace one. Try double checking each pin is where it should be. The most likely cause of this is if you’re pressing the potentiometer in more than one position. This is normal and can actually be used to create some neat results.